MELISMATIC: NOW KPOPPING: TVXQ! Says "Catch Me"
NOW KPOPPING: TVXQ! Says "Catch Me"
It may be long overdue, but still, you knew this one was coming. SM's TVXQ! have returned to the Korean stages with their latest comeback single in "Catch Me", a Euro-dancey inspired single that refreshingly varies a bit from their usual Korean power singles. While songs "Keep Your Head Down", "O" and "Rising Sun" were often notated for being very vocally heavy-handed and in your face, "Catch Me" is more along the lines of "Mirotic", in that it wouldn't sound too out of place in the back catalogue of a British/Swedish dance artist (male or female). This is something we should all congradulate our favorite KPOP duo for, as the subtlety required to make a pop song of this caliber work with intensity is not really something most people would attribute to Yunho & Changmin. The song itself is kind of like the opposite of "Keep Your Head Down" -- "Catch Me" is a warning to a lover to wake up and prove their love to TVXQ!, to make them want to stay in this relationship, otherwise they will be gone. The lyrics bite. "I want you to beg for me so I'll wait here with you/Tell me, "Don't ever leave me"/You Fool, why do I love you?/I only have you, but why?" Ouch. If anything, the minute I first heard "Catch Me", it sounded quite a bit like something that very easily could have fit onto Tone, the group's last Japanese release. It echoes quite a bit of the Eurodance feel that was a recurring genre theme of choice on that album. Perhaps that is why, as an ardent fan of TVXQ, "Catch Me" felt familiar despite being brand new. However, in terms of their Korean discography, a song in the style of "Catch Me" is new territory, so I commend them for trying to bridge the gap between their Korean and Japanese sound styles. With that said, "Catch Me" is a bit like four songs in one. It's one part Europop, one part lite dance, one part rock edge (with the pre-requisite Changmin groans and screams) and one part (you knew this was coming) dubstep. Yes, the thrown in dubstep breakdown was a bit...unnecessary. There's no need to point that out further. Now that we've recieved word that Taylor Swift has recorded a dubstep inspired song for her upcoming album Red, I think we all can agree the dubstep trend has officially been beaten to death, and its appearance in KPOP doesn't change that fact. I can tolerate it from younger groups but from the genre's reigning Gods? Zzzzzz. Dubstep bits aside, it's really one of those songs that is a bit of a grower until you see the video and live performances. In the case of TVXQ!, often these two are basically the same deal, no matter how vocally challenging the song is or how risky the choreography becomes. And when it comes to "Catch Me", TVXQ! really delivers not just vocally, but dance-wise too. Like SHINee's "Sherlock" before it, "Catch Me" was choreographed by Tony Testa, and as far as I'm concerned, he can continue to work with my faves all he likes because he has yet to dissapoint. "Catch Me"'s choreography inspiration is centered on the visual appearance of a dragon. Changmin & Yunho, along with their plethora of male background dancers, create a visual display where they both work together as cogs of a singular machine and appear seperately. This style makes performances so incredibly exciting to watch as its more of a storytelling than a memorized routine. Tell me that is not sick as-eff (as the kids say). Go ahead. Try. And if you're still not convinced, take a gander at a live performance of the song. The choreography is the same performed live, with live vocals and all. Your move, One Direction. 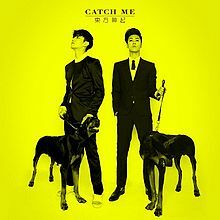 As for the rest of Catch Me (the album), it has followed in the footsteps of Tone as the third overall release of duo-TVXQ! and further cements how strong and comfortable they are since losing three members from their rank. While pieces of Keep Your Head Down felt a bit filler-esque and sparse, Catch Me feels much grounded in the strengths of Yunho and Changmin, and that is not a bad thing. Much of this feeling was clearly sourced by their success in Japan as a duo, as the Tone feeling lingers throughout. Dancey "Gorgeous", produced by SM staple Kenzie is a fun ditty. "I Swear" was written by Changmin, continuing his record of writing the lyrics for a song since Mirotic. Japanese power single "I Don't Know" also appears in a Korean form and it's just as fun as the original. Yoo Young Jin provided one other song in addition to "Catch Me", in the sultry ballad "Good Night", which has quickly become one of my favorite post-DongBangApocalypse ballads. But my personal favorite is the rich, very rock flavored "Getaway" that really relies on the power vocals of Changmin and the swagger of Yunho -- a feel that is very distinct to this duo. Overall, while it's not as solid a release as Tone was, it's certainly more listenable overall than Keep Your Head Down and is proof the duo is moving in a stronger direction not just in Japan but in Korea, too. Epic sound effects. We meet again. Those are some serious gloves our duo are wearing. Good thing there's no shoving in this choreography like in "Keep Your Head Down". Min + Those Gloves = I fear for Yun's Moobs. I'm just gonna say it. Changmin is my overall #1 bias but that hair has got. to. go. The weird blonde + the awkward bowl cut...I just...it makes me so...grrrrr. To be honest, Yunho's hair is not much better but I'd take that over Changmin's any day. Shallow Thoughts Aside, it needs to be said that Yunho heard the call of being vocally shown up by the maknae all day, err day and really stepped his game up. I sincerely mean it. And what a perfect song for it as well, as the choreography artfully depicts the two of them as mirror images of each other. Yay, U-Know! As I've stated, the choreography is stellar -- my only real complaint is the "chorus" bits when the focus is soley on Yunho & Changmin, when they do that awkward jumping and body-thumping/pelvic thrust bits. It just looks...forced and pained. The rest, top notch. So it makes me underwhelmed to get to the climax bit and it's...that. The standing in line bits like they are doing The Locamotion totally made me reminisce for NLT cerca "That Girl". Anyone else? I'm sold! Not sure I like the extra dose of dubstep for something played on the radio (the track loses a little momentum there), but that chorus has a mega hook. Choreography is sick, too. I love that they let the dancers sweat through their suits at the end, too. That's dance realness right there.